The Arlo Pro Smart Security System with 2 Cameras is a wireless security camera system, which records video in 720p. Along with the Arlo app, you can view footage of your home from your smartphone and even talk to visitors directly when you’re on the go. The Google Home Hub and Arlo Pro 2 Smart Security System bundle will create more comfort and security for your home. The two devices integrate seamlessly together to bring you fantastic smart control and unparalleled surveillance for the things that matter most. The Google Home Hub and Arlo Pro 2 Smart Security System bundle is the right way to get more security for your home. These two devices integrate easily to deliver great features that compliment one another perfectly. The combination is also enhanceable with the Arlo Smart add-on that will assure impeccable smart features that will set your home’s security system apart. Voice activated assistance: Be in full control without lifting a finger. 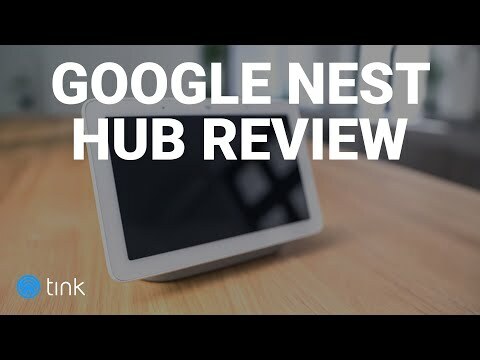 The Google Home Hub is the ideal smart hub, since you can request multiple things from the sound of your voice. Just start with ‘Hey Google’ to activate the voice assistant. Displayable answers: The Google Home Hub’s 7’’ LCD touchscreen expands its smart capabilities. Just say “Hey Google, show me the front door,” and you will be able to live stream your Arlo Pro 2’s camera right on your Hub’s display. Two-way audio: Communicate through your camera with the built in intercom system. The Google Home Hub will allow you to listen and talk to people in your camera’s view. If you aren’t home, you can still communicate through your smartphone via the Arlo app. 1080p HD quality: Get sharper and more detailed surveillance with the Arlo Pro 2’s 1080p recording quality. This crisp image will look fantastic on the 7’’ touchscreen of the included Google Home Hub. Activity zones: Specify areas you want to get motion and sound alerts so you only get the notifications that matter. Arlo app: Have full control and overview of your Arlo Pro 2 Smart Security System’s features. No matter where you are, you can always make sure the things that matter the most are safe. The combination of the Google Home Hub and Arlo Pro 2 Smart Security System will bring more peace of mind. The Arlo Pro 2 will deliver state-of-the art home security while the Google Home Hub will make managing your Arlo system and other smart devices a breeze. Making sure the things you love most are safe and secure is always important. The Google Home Hub and the Arlo Pro 2 Smart Security System is the perfect partnership to intelligently increase your home's comfort. The Google Home Hub’s 7’’ LCD touchscreen compliments the Arlo Pro 2 Security System flawlessly. You will be able to receive notifications, view your cameras live stream, and communicate with visitors all from one place. If that isn’t enough, you will be able to do all of this without lifting a finger thanks to the built-in Google Assistant. Increase your home’s safety even more with an Arlo Smart Subscription. This affordable add-on expands your Arlo Security System’s features to whole new level. Get intelligent person and package detection as well as more cloud storage so you can playback footage for longer period’s of time. Just plug in the Google Home Hub to get started and download the Arlo app to get your cameras up and running. Both devices are made of high quality materials that are built to last. The Arlo Pro 2 cameras are also weather resistant. The Arlo app was everything you need to set up your cameras and monitor them no matter where you are. The Arlo Pro 2 Security System provides clear footage and a two way audio system that will give you detailed surveillance. The Arlo sensors are high quality and will notify your Google Home Hub when something is detected. Both devices have a sleek, white design that doesn’t distract. Video material is stored on Arlo's servers and can be deleted manually or automatically after seven days. This combination for smart devices will surely increase your home's security and comfort at a fantastic price. Arlo Pro 2: 3.1 x 1.9 x 2.8 in. Can Google Home get information from / use / control my other apps? Yes. If you have agreed to let Google Home do so, it will access your search history to provide you with better, more helpful answers. What are the differences between the Arlo Pro 2 Add-on Security Camera and the original Arlo Pro? The Arlo Pro 2 Smart Security System has the following extra features: Full HD 1080p Video Resolution, 20 degrees wider field of view, 3-second look back during motion detection, Activity Zones during wire-free usage (requires Arlo Smart subscription). How does the Arlo Smart person detection feature work? Using algorithms, your Arlo security cameras alert you when a person is detected and filters out everyday movement, such as plants blowing in the wind.